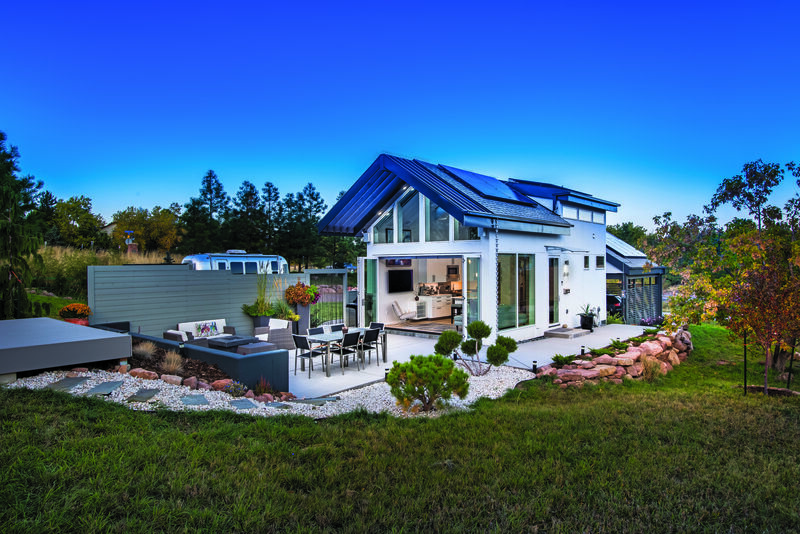 As the tiny-house movement continues to spread across the United States, even custom clients with the means to build larger have embraced the idea of building smaller. Large homes seem less appealing given the high cost of land, materials, and labor and the ongoing costs of operation and maintenance. Clients are concerned about the impact a large home will have on the environment, and asking themselves how much space they really need to accommodate their lifestyle. For many, the answer is to pare down. The owners of the tiny house in Boulder, Colo., profiled in this article are an outdoorsy couple whose careers frequently take them on the road. They lived in an Airstream trailer while contemplating builing a larger home on their Colorado property, and came to realize they didn't need quite that much square footage for a part-time residence. Thanks to the architect's clever use of light and volume, the 450-square-foot home lives much larger than its compact footprint. And while 450 square feet would have been a tight squeeze for another couple, their 800-square-foot cottage on Martha's Vineyard, Mass., (also profiled here), is a roomy summer refuge. Granted, homes this small aren't going to work for every client, but they show that efficient design is desirable regardless of size, and indeed can be beautiful. Empty nesters with active lifestyles no longer view "downsizing" as going from 10,000 to 5,000 square feet. They're scrutinizing their budgets and deciding that 2,500 square feet is enough, or 2,000 square feet, or even less. 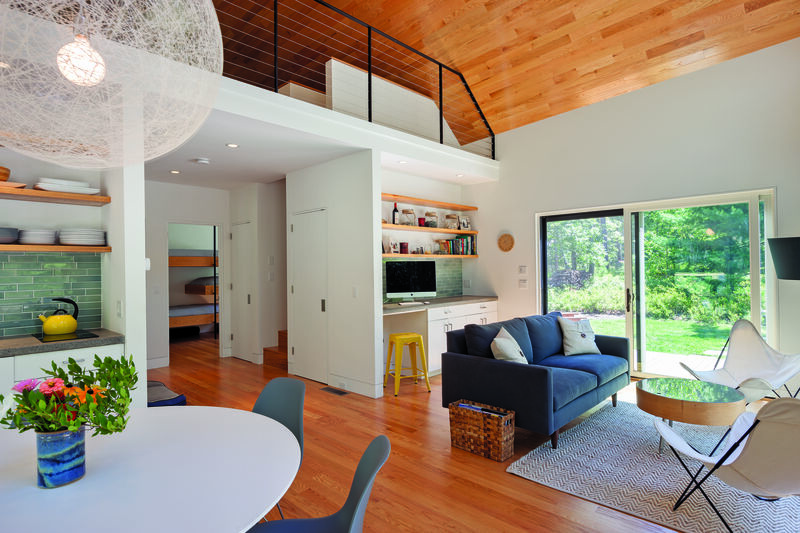 San Francisco architect Jonathan Feldman had never done a long-distance project until a client asked him to design a cottage on the site of her parents’ home on Martha’s Vineyard. “She used to spend summers there with her parents, but when she got married and had three children, they quickly outgrew the guest room,” Feldman says. The wooded lot is approximately 2 acres, well in excess of the minimum size the town requires for an additional structure. “[We were] allowed to build a separate single-family home of up to 800 square feet,” says builder Jack Gray, who is based on Martha’s Vineyard. Gray says just enough of the lot was cleared for the house and septic system. "There's no limitation on how much we could clear, but they like to keep it wooded," he says. "You can hardly see the house from the street because it's hidden behind the main house." Feldman says the clients “are modernists and wanted a design that was fun and fresh, but would also relate to [her] parents’ more traditional sensibilities and the existing, older house.” He organized the space into a lower level that contains an open living/dining area and two bedrooms, divided by a large storage room and a full bathroom. The kitchen is on the other side of the bathroom wall and includes a sink, refrigerator, dishwasher, and two-burner cooktop. There is open shelving above the sink for dishes, and storage cabinets below. The main level also includes a linen closet, a stacked washer/dryer, and a mechanical room. The storage “zone” provides acoustic separation (imperative in such a small space) between the bedrooms and the living/dining area. A staircase tucked into the hallway leads to a loft where the kids can watch TV, play games, and doze in sleeping bags if they don’t feel like using the bunk room below. “The parents can close their bedroom door for privacy, while the rest of the house is a bit of a free-for-all,” says Feldman. The large deck functions as the family’s outdoor living and dining room and has a fire pit and multiple seating areas. 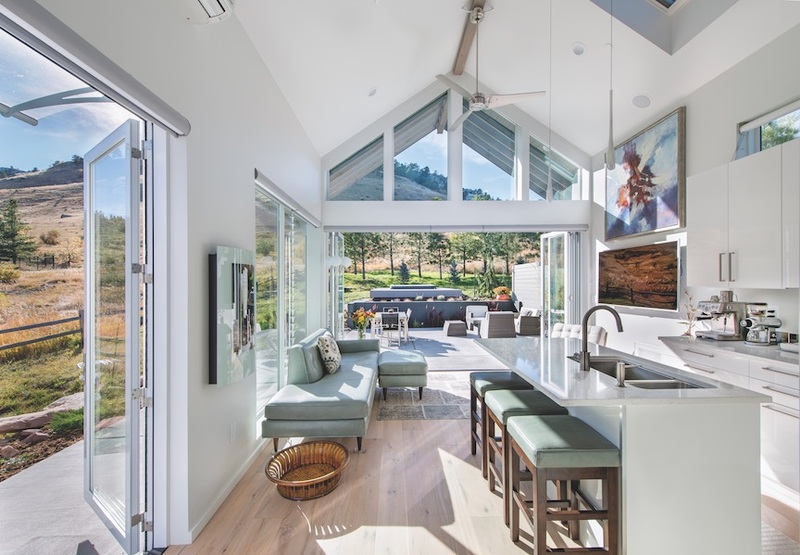 The most noteworthy detail, Feldman says, is “the not-quite-level ridgeline, which is not very noticeable at first but makes the building and the interior space subtly edgy and modern.” A large central ridge beam eliminated the need for collar ties or cross beams, providing an open ceiling effect. Gray estimates that the ceiling is about 20 feet at its highest point. Large amounts of glazing enhance the open feeling. There are two sets of sliding glass doors on the rear topped by fixed clerestory and triangular windows, and sliding doors on each side of the living/dining area. The metal roof is something not commonly used on Martha's Vineyard and is "an interesting take," Gray says. "Houses here usually have architectural-grade roof shingles." The black roof and black stained sidewalls also make the home stand out. The clients owned a scenic, 3/4-acre lot in Boulder, in the foothills of Colorado’s Front Range. Frequent travelers with no children or pets to encumber them, they wanted to split their time between homes in California and Boulder. Eventually the clients began to question the wisdom of investing in a large house, given that they spent so much time on the road. They were living in an Airstream trailer on the Boulder property for nearly a year, “and I think they were fairly happy, although it was a little snug,” Tomecek says. "They're active, mobile people and were more interested in living outside on the land and very efficiently inside when necessary." It might have been the Airstream experience that clinched their decision to shelve the plans for the main residence and build a small one instead. With neighbors to the south and mountains to the west, the architect was careful to position the little house as close to the open space as possible. Views of the western ridge are literally right outside the back door. 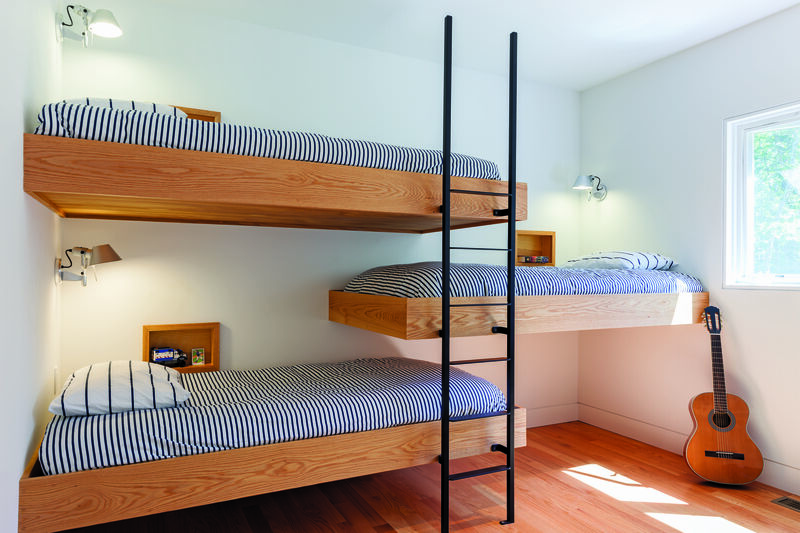 In order to maintain its OAU status, the home maxes out at 450 square feet, but the design makes it feel much bigger. Tomecek says vaulting the ceiling made for the perception of a larger space, especially when coupled with a 50-square-foot loft. 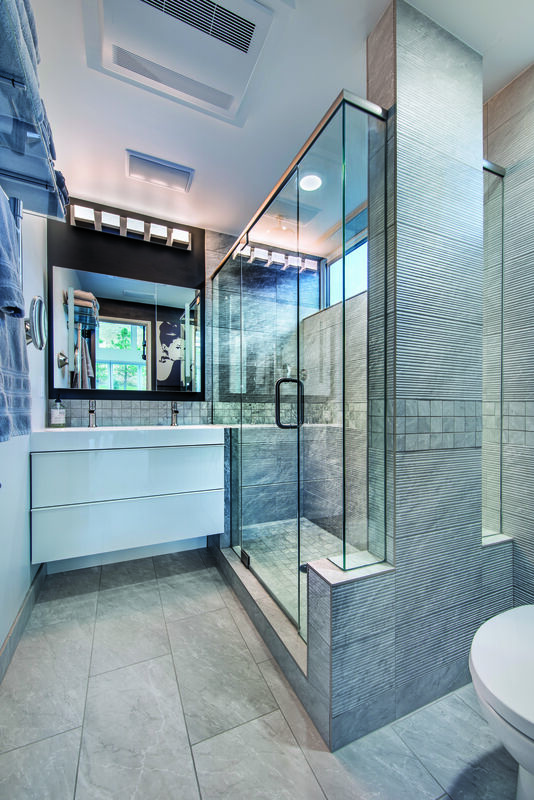 The only enclosed space is the three-quarter bath, which is sized to accommodate the needs of two people getting ready at the same time. Skylights in the loft and main living area, along with clerestory windows, drench the home with natural light. An island kitchen opens to a living area with a wall-mounted TV. The look of the interior finishes was influenced by the efficient design typically found on a catamaran or in a luxury hotel room, two of the couple's favorite places to stay when on the road. During the design process, the clients decided to flip the original floor plan, putting the bedroom downstairs and a shared office in the loft. A large glass bifold door allows the the west-facing wall to virtually disappear, blending the indoor and outdoor spaces. The patio more than doubles the living space, which the clients accessorized with a grill and dining/seating areas, and beyond that, a hot tub and swim spa on an elevated deck. Tasteful landscaping and hardscaping complete the picture. Maximizing storage is always a challenge in small homes. In this case, the solution was to put it underground. Local builder Ed Goodman created a crawl space with a ceiling height of nearly 6 feet. For the clients, Goodman says, it functions like a full-height basement. The spiral staircase leading up to the loft also leads downstairs to the crawl space. The OAU already conserves energy due to its reduced size, but to enhance energy efficiency (and exceed Boulder’s green-building standards), Goodman installed a 3.85 kw solar array on the south-facing roof, offsetting electrical usage by 93 percent. Even the carport at the rear of the home has solar panels to keep it at a comfortable temperature. Other green features include high-performing windows, doors, and insulation; LED lighting; and VOC-free paints and sealants. The home’s small size and efficient planning allowed the clients to splurge on furnishings, says Tomecek: “The IKEA kitchen, with its nice appliance package, is balanced by an expensive sofa and light fixtures. They call [it] their little mansion.” Parked nearby is the Airstream trailer where the couple's journey to tiny living began. 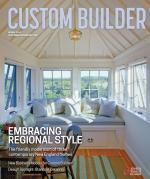 Comments on: "Custom Clients Opt For Smaller, Smarter Homes"